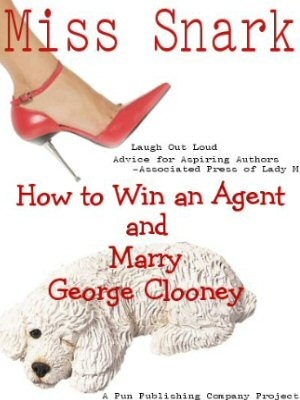 Miss Snark, the literary agent: No No NO!!!! The 2005 Guide to Literary Agents (Writer's Digest) suggests one page of synopsis for every 25 pages of book. Ack!I've done four verions of my synopsis so far. They range from 1 paragraph to three pages. Yea well those clever little elves at WD don't have to read the damn things now do they? Considering that most manuscripts I have weigh in between 200-500 pages I gotta tell you: NO. Synopses are mostly horrible to read. For proof see Crapometer #1 - #99. They don't have conflict, character development, much humor (serial scrubbers aside of course) or suspense. That's ok though; they are not designed for that. BUT given that you know this is going to be a tedious read, just do me a big fat favor: make it short. 1000. Words. Or. LESS. You think you can't do that? Trust me, you can. And you SHOULD. Long synopses, unless you are writing bodaciouisly long books are stupid. Repeat after me, in fact, let's all chant: Less is More. Less is More. Less is More. Even using Miss Snark's minimum of 80,000 words, the synopsis would clock in at around thirteen pages! What do they want you to do, describe everything, right down to the grime under the main character's fingernails? Does anyone else get the feeling that Writer's Digest has lost its touch with the writing world? Most of their articles are about POD, and if you read this blog you already know the horrors of that. I used to think that if it was endorsed by WD it was golden. Now, I'm skeptical. WD has its uses. Pick up a copy, note each ad for a publisher, editor, or agent, and you'll have a nice start on a list of scums in the biz. Something else that's been popping up on a few agent's website is the seperate 'full' bio sheet. What on Earth are you supposed to include in THAT, especially if you've got zip, zilch, zero credits to your name? Have any other Snarklings actually written one of those? Elektra, agents hope to find something in your "Bio Sheet" that they can spin to "sell" the author: that you wrote yourself out of the ghetto, or have overcome a handicap, or is a Playmate, or used to fight bears, or... whatever. In the light of recent scandals with authors writing fake autobiographies -- and being successful -- perhaps your only chance is to fake your bio sheet. (NAME) was born in a nunnery and brought up by an Oriental mystic. After killing a violent classmate in an inner-city school, (NAME) joined the French Foreign Legion and survived a bloody African civil war. (NAME) accidentally married a sibling, divorced, and fell into drug addiction, but started writing to overcome this personal crisis. (NAME) is now happily married to a Bavarian dwarf." Jeeze Miss Snark, I'm starting to think you're John Silbersack in drag. He's always less is moreing me with my manuscripts. Now look what you made me do (the combined-multiple-!-and-? thing, which I hate). Try "one page per novel." And in 12-point font. Even a thousand words will usually make people's eyes glaze over. Mine's three paragraphs including the bio. I've had agents ask for long synopsis. The first time an agent asked for one I wrote her back and asked, "How long is long?" She wrote back, "10 to 20 pages." That's not a synopsis, that's a short story. But she's the agent, she calls the shots. I wrote it. It was a horrible thing to write. Synopses writing is bad when it's a page, but when it's twenty? Horrible. Horrible, horrible. So what happens when one's idee fix of a potential agent asks for far more than 1,000 words? Does one comply - or does one send the 1,000 words - and a link to your blog? I think it is only sensible (and common courtesy) to send whatever the agent asks for. Most of them aren't specific: they just say "synopsis." In this case, I suggest following the one-page rule; but if you think that making it longer will help you (it won't: much like an after-dinner speech, longer just extends the opportunities to annoy), at least keep it under 1,000 words! 1,000-word synopsis. I like that. It seems like it would be easier than even the "short" 3-page one I currently have. That thing was a major bear to write!